The book publishing world is, in fact, another world—an alternate reality with its own time and rules and atmosphere. You can't get to it by simply hopping on an airplane, you need a transcendental vehicle of some kind, like the wardrobe in the Narnia books. And you can only access it using very powerful magic. And you can't just go to this mystical place, you must be summoned by the powers that be. Last May, this happened to me; I stumbled through my own "wardrobe" into Publishing World by way of an email from a lit agent named Victoria. Since then I've maintained communication with that world through emails and phone calls, little things that briefly pulled me out of this universe and into that one. But aside from these fleeting otherworldly encounters, life hasn't changed all that much. I worked on edits with Victoria for about half a year, and then we took my book on submissions. The submissions process was no joke. It was like the querying thing all over again, except this time it was my agent sending my sweet baby novel to the editors at big publishing houses. And they were reading my work and passing it around their offices and getting second and third opinions and discussing its saleability and its characters and its potential, and even writing their thoughts on it down for me to read. It was exhilarating! It was an adrenaline high! It made me want to kind of puke a little bit! It was also incredibly (surprisingly) validating. Editors, as it turns out, are kind and encouraging human beings who want your book to be the next big thing just as much as you do. So Subs was...an experience. One which I do not necessarily care to repeat any time soon, but also one which I...loved. Kind of. I don't know. Here's another thing about Publishing World: time there is like water: it freezes, and then it flows. Nothing happens at all, and then huge things happen all at once, like explosions, like a sporadic, ob-nox-iously spaced-out fireworks show in a peaceful night sky. It's because there are so many moving parts in this machine. So many people to read so many words and make so many decisions and send so many emails. And even after something happens, the effects aren't felt in our world for a long time. Which is why I'm only now allowed to write this blog post. But here it is! As Etta James would say, Aaaaaat laaaaaaast. Boom that song's stuck in your head forever. In January, we sold my first book—and, at the same time, my second book (which isn't even written yet, because apparently in publishing, things either happen way after you wish they would or way before you thought they were possible). The first little book baby is due June of 2019 from Lake Union Publishing. I had a really great phone call with my editor there back in January, before I accepted their offer, and was immediately in love with her and Lake Union and all of their wonderful ideas. They seemed so excited about my book, about working together, and I think that remains one of my favourite parts of my adventures in Publishing World to this point: those moments where I feel like I actually belong there, am wanted there, like I didn't just wander in accidentally. You know? The day of the offer, I went out for supper with Barclay to celebrate and then, while Victoria negotiated my contract, my life went back to normal and I wasn't allowed to say anything and it felt like it had all been a wonderful dream. The same dream I've been having since I was, like, five. I thought that maybe, when it became Internet Official, when the deal announcement went up on Publishers Marketplace and I wrote this blog post, that it would all feel real, and that Publishing World would feel like a place on this planet. 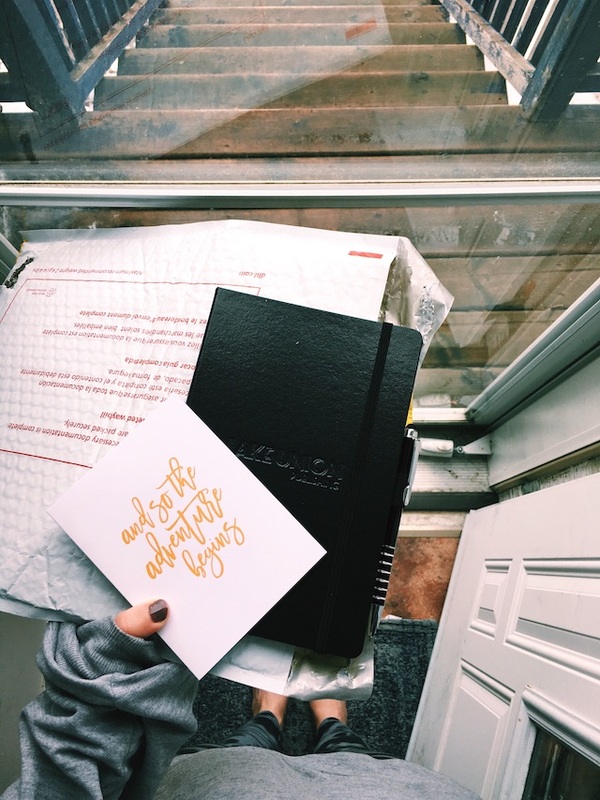 But then today, I received a little package in the mail from my author relations manager, a notebook embossed with my new publisher's name, the name that will be on the spine of my books, and I realized that it probably never will feel completely real. It might always feel like a dream. And I'm quite okay with that.